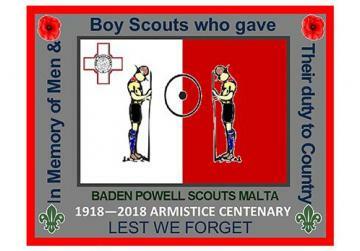 Baden-Powell Scouts Malta is holding a weekend of events to commemorate 100 years since the end of World War I. It is commemorating three things: the sacrifices made by men and boy scouts who served and died in WWI, Maltese boy scouts and men who served and answered the call of the country in Malta and abroad, and the various roles scouts and former scouts were involved in. The event will take place on Saturday and Sunday. Tomorrow, an exhibition of scale models and of the stories and vintage promotion material which aimed at enlisting as many boys and men to take part in this unforgettable conflict at will be on display at the Marconi Amateur Radio Circle (MARC), Mtarfa from 10am. Members will be on their shortwave transmissions for the occasion. At 3pm there will be a ceremony at the Commonwealth Cemetery at Ta’ Qali. This will be attended by President of Malta Marie-Louise Coleiro Preca, who will then visit the exhibition at Mtarfa. On Sunday at 10am, Baden Powel Scouts Malta top officials will attend the Remembrance Ceremony at the War Memorial in Floriana. At 9am scouts will be manning the previous day’s exhibition which will be near the stand manned by MARC, as participants in Military Mtarfa. Baden Powell Scouts Malta also produced a badge for this Centenary, which will be worn by all its members for the next 25 years. 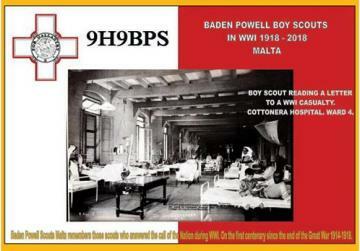 A QSL card is also designed for the event bearing the call sign 9H9BPS for Baden Powell Scouts Malta.